Alloy Yachts announce the launch of their project AY44, a 39.16m motor yacht which started her construction in July 2010. Even if the weather was particularly bad, the launch was successful, in the presence of the owners and the yard team. AY44 is the second explorer motor yacht for Alloy Yachts following the delivery of VvS1 in 2007, but she has a steel hull, a first for this yard specialising in aluminium construction. AY44 is designed by René Van der Velden with an interior by Redman Whiteley Dixon. With a Gross Tonnage slightly under 500 GRT, she's optimized for long range cruises with large interior volumes, storage and decks outside. 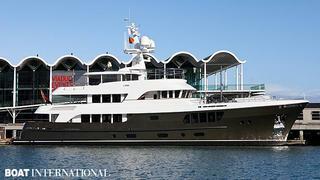 The owner’s representative is Peter Wilson of MCM, who has worked on several projects with Alloy Yachts. Few other details were provided by the yard for the moment. We can add that her name should be CaryAli, the one currently displayed by her AIS transponder. Now moored in Viaduct Harbour, she will start her sea trials to be ready for a delivery before the end of the year.